"We plan to launch the first Sailfish device in November. It will be 4G-enabled and will come under the sub-10K price range"
Two Intex Aqua Fish smartphones were expected to be unveiled at MWCS15 after Intex published a short video clip for a moment. However, the video was soon held back and no phones were unveiled. Only the name of the smartphone was clearly visible, "Intex Aqua Fish", all around the Intex stand. The device used for demoing Sailfish OS 2.0 at Mobile World Congress Shanghai 2015 was only a reference device, according to Jolla. So, we have Jolla's press release, big things shared by to Jolla and their partners but nothing to see yet from Intex. They actually haven't even told if the reference device was manufactured by them or not. Price: One of the models is in the price group below 10 000 INR. Price of possible other models is unknown. 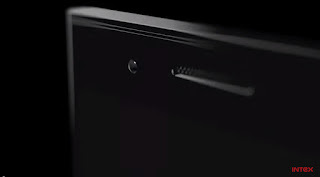 Screen size: unknown, speculated 4.7" - 5"
Jolla's announcement of sales by the end of 2015 in the markets in India has had two later corrections, first one shared by Antti Saarnio in Russia scheduling Sailfish India launch to Q1/2016, and second confirmed by Intex to us, scheduling the product launch to the first week of May 2016 in India. The phone will be exclusively available only via Snapdeal online marketplace, and only in India. Update: To be launched to the markets elsewhere? Availability of Sailfish OS Intex Aqua Fish anywhere else but in India is yet behind thick curtains. Intex has already expanded their sales to Bangladesh, Sri Lanka and Nepal and shared plans for Russia and Africa, but they do not list any specific phones except for Aqua Trend models. "Together with the Sailfish India ecosystem partners we believe that we can provide an exciting alternative for smartphone lovers in India and later globally as well." Jolla Phone or Intex phone? Reference device used at Intex booth looks like a Jolla Phone, just in different covers, and it was used to showcase Sailfish OS 2.0. It might have had a demo version of the operating system as well. Price INR 15000 (EUR 215) has been mentioned by an Intex representative, but not related to any specific model. Some of you sailors are an impatient lot. If the deal does materialise - most probably with the Intex Aqua G4+. (I'd like a black one please) considering the very short lead time to market. That should have been the spec of the original Jolla phone - thats why I didn't buy one but I did order the tablet. Hopefully more news tomorrow - so take a deep breathe, have a good hot shower, sit down and relax. Interesting! Your source, if possible to share? Which brands might be better for the launch in India in your opinion?